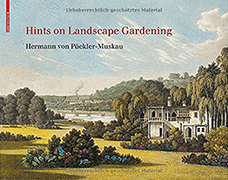 Prince Hermann von Pückler-Muskau’s Andeutungen über Landschaftsgärtnerei (Hints on Landscape Gardening), sponsored by the Foundation for Landscape Studies and published in association with Birkhaüser, is now available in a new English translation by John Hargraves. An important work for both landscape historians and landscape architects, it is a keystone in the revival of Pückler’s reputation as Germany’s “Green Prince,” a landscape-design genius on a par with Frederick Law Olmsted. Still valid as a set of prescriptions for both professional park makers and amateur estate gardeners, this important treatise, first published in 1834, introduces the anglophone reader to the principles behind Pückler’s conversion of his 1.4-square-mile Prussian principality into a magnificent park. Along with the text, this handsomely produced book contains reproductions of the forty-three colored lithographic plates found in the original German folio. Its timely publication coincides with the current restoration Muskau Park following years of neglect between the end of World War II and 1991 when it lay behind the Iron Curtain.